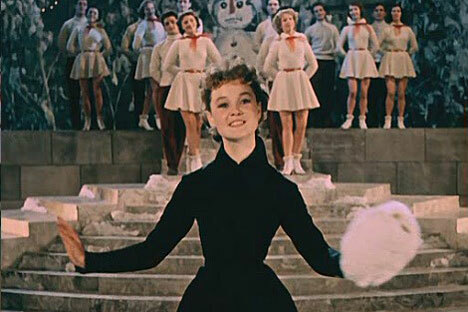 The Carnival Night film brought fame to the actress Lyudmila Gurchenko. Source: Kinopoisk.ru. Looking at the TV channels for Dec. 31, they all have one thing in common: several iconic films. The lead-up to New Year on Russian TV is unthinkable without the a series of New Year pictures made thirty or more years ago. Neither the latest films, nor Hollywood Christmas comedies can overshadow their popularity. Anyone who can explain the phenomenal popularity of these films will crack the mystery of the Russian soul. The director of a Culture Centre who has a vague idea of art, fails to approve the New Year program proposed by his subordinates. He proceeds on the basis that the New Year holiday is a serious matter. He invites an astronomer to give a lecture on whether there is life on Mars and minimizes the entertainment part. The audience watches the characters using every trick in the book to stay on the right side of the director while not spoiling the party. This audacious musical comedy hit the screens a year after Stalin’s death. The humour and audacity of that film can only be appreciated by those familiar with the way mass culture was organized in the Soviet Union. Many of the characters’ phrases have become bywords and form a part of folklore. But it became a cult movie mostly because it showed for the first time the triumph not of Love or Goodness, but of common sense and uninhibited merrymaking. The story is reminiscent of Cinderella, but the events take place on New Year’s Eve. The cast of characters is simple: the evil stepmother, the henpecked husband, the stepmother’s favourite daughter and the stepdaughter who is treated as a maidservant, and made to do all the undesirable household chores. On the wife’s orders the father takes the stepdaughter into a remote forest consigning her to certain death. But the girl does not die, instead she finds a bridegroom clad in a red kaftan and a dowry for their wedding, all through the good offices of Uncle Morozko, the kind ice demon of Russian winter. The wicked sister who has also been sent in search of gifts, insults Uncle Morozko and ends up getting only a sled pulled by pigs and a crow in a box, instead of a dowry. The tale was filmed by Alexander Rou, the genius of storytelling in the Soviet film industry. It was technically a very advanced film for its time, with excellent special effects which of course look rather naive today. Steven Spielberg once said that the film was the precursor of many Hollywood masterpieces. The story of how alcoholic over-indulgence on New Year’s Eve may change the course of people’s lives. After a boozy party a company of friends mistakenly put the wrong guy on a plane bound for Leningrad (present-day St Petersburg). Before he sobers up he reaches Leningrad and takes a taxi to his home address. He staggers into what he thinks is “his” Moscow flat. The plot evolves - taking the young man, and the girl who lives in the Leningrad flat from hostility to love. The girl abandons her fiancй and the Moscow visitor forgets about his bride waiting back home. If there has to be just one New Year comedy, then The Irony Of Fate is it. Together with Moscow Salad and mandarins it makes up the three main features of the New Year in Russia. On 31 December the film can be watched three times during the day by switching channels. The popularity of the film didn't fall off, even after a remake timed for the 30th anniversary of the film was released. The film has even inspired some jokes. One goes like this: after a car crash a guy cannot remember his age. The doctor asks: “How many times did you watch The Irony of Fate ?” “About twenty,” the guy replies. The doctor turns to his assistant and says: “Write down his age as twenty”. A kindergarten principal causes three hard-core criminals to reform. It so happened that Troshkin, the kindest of individuals, looks exactly like a dangerous criminal nicknamed “Dotsent”. The police plant him in the company of Dotsent’s associates with an assignment to find out where they've hidden the loot. The situation takes a dangerous turn when Dotsent himself escapes from prison. The film is part of the New Year collection because its most moving section - when the escaped criminals decision to reform falls over the New Year. Gentlemen of Fortune is not just a New Year film - it is regarded as one of the best Soviet comedies. Precise statistics are lacking, but there is a sense that it has produced the largest number of memorable phrases among all Soviet films. The rough count is more than 150. A monument to actor Yevgeny Leonov as Dotsent stands in front of Mosfilm studios. There is hardly a Russian who does not recognise the actor and the fragment of the film perpetuated in bronze. It is interesting that the censors were afraid to release the film - because it was full of underworld jargon - until Leonid Brezhnev gave his approval. A hilarious tale which shows that even magicians using dirty tricks cannot overcome pure and genuine love. The action takes place in a Soviet-era office that studies and practices magic. An evil sorcerer deploys his wiles to win the heart of a girl, and her bridegroom - an ordinary mortal - tries to bring her back. According to the rules of the genre, the spell is broken by a kiss - but to make matters more difficult it's not the guy who has to kiss the girl, but the girl who has to kiss the guy. In stories like this it is not the outcome, but the process that matters. Watching the film is sheer delight - with a star-studded cast. However the main miracle connected with in the film occurred even before it was shot. It was made from a script by the Strugatsky Brothers, whose books were banned at the time. However, the film’s director, Konstantin Bromberg, managed to tweak the text of the script in such a way that it got the thumbs-up from Goskino - the main film censorship agency.